Arkansas Access to Justice is excited to partner with the University of Arkansas School of Law to host a virtual legal advice clinic on March 8th from noon to 3 p.m. The event will be on the University of Arkansas School of Law campus in Room 336 and will start with a one hour CLE to train attorneys on how to do pro bono online using AR.freelegalanswers.org. Additional attorney volunteers are needed. Volunteers are asked to register at the link below. So how does a virtual legal advice clinic work anyway? At this clinic, attorney and law student volunteers will work together to answer legal questions that low-income Arkansans have posted ahead of time on AR.freelegalanswers.org. All clients will be screened for eligibility beforehand and attorneys will get to preview questions before they decide which ones they want to answer. All work done on the site is covered by a malpractice policy provided by the American Bar Association. Why do a virtual legal advice clinic instead of seeing clients in-person? It’s far more efficient. At our last virtual advice clinic, we only had four attorney volunteers, but we were able to help thirty clients! If this event had been a traditional, in-person clinic, we would have only been able to help about eight clients. Volunteers consistently tell us it’s the easiest way they’ve seen to do pro bono. These types of clinics are also more convenient for our clients because they don’t have to take time off work or drive long distances to get the advice they need. If you have questions about this event, please contact Jordan Rogers at jrogers@arkansasjustice.org or 501.492.7174. Are you a person looking for legal advice? Please note that we will not see any clients in-person at this event. All client questions must be posted at AR.freelegalanswers.org before March 8th. AR Free Legal Answers is operated jointly by the American Bar Association, the Arkansas Bar Association, and the Arkansas Access to Justice Commission. Financial support is provided by the Arkansas Bar Foundation. 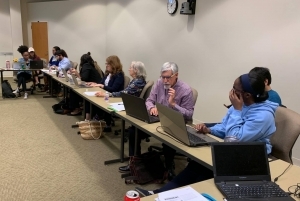 Attorneys and law students work together at a virtual legal advice clinic during Pro Bono Week 2018.